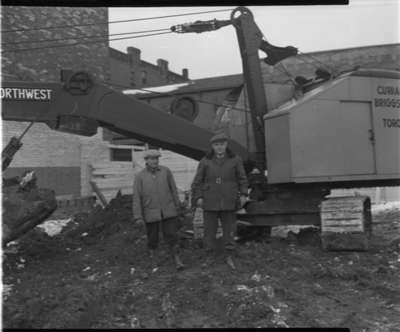 Black and white negative showing J.J. McLaren (Superintendent for Curran&Briggs; left) and Garnet Thompson, general contractor, at the sod turning ceremony for the construction of the new Public Utilities building. The Public Utilities Commission office is located at 128 Brock Street North. Public Utilities Building Construction, 1948, Marjorie Ruddy. Whitby Archives, 08-006-058.